How to nail a chin-up! They seem so ever elusive to me… I get one .. sometimes even two… then I have a big weekend of beer and chips and I am back to zero again. Guys seem to be able to do them with a little more ease, but let’s not get into that old chestnut… If you are after a chin-up then follows are some exercises that you can work on to help get you there (and possibly losing a couple of kgs so you don’t have as much to pull up – but that’s a post for another day). This is where we start everyone on their road to chin-ups. Using a TRX (or some other similar suspension straps) or rings, grab the handles, palms facing, and hold them by the sides of your chest. Take a step towards where the straps are anchored from, hold your body straight and extend your arms. Pull your body back up towards the handles. The further you step your feet in (and more parallel to the floor you become) the more of your own weight you pull up and the harder it makes the exercise. 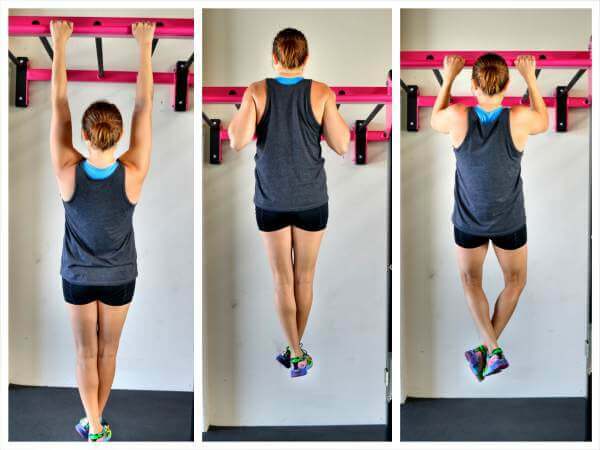 Pull-Up hold: do whatever you need to do to get your chin over the bar (like jump or get someone to hold your feet) and then hang on for dear life! Or something like that. Hold yourself as still as possible without raising your knees, for as long as you can. Once you’ve got the hang of the isometric holds (hang… get it?) then you can work on lowering yourself down slowly. Jump up one count, hold for one count and then lower down, three, two, one…. Your lowering will get faster the more you do. 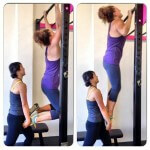 This is the best way I know to get better at chin-ups. In between chin-up days you can also head down to the weights floor and get on the old lat pull-down machine to just get out some reps. (If you don’t know what the hell I am talking about – get a trainer to show you). Get someone to hold your feet or you can use a resistance band if you don’t have a personal available. The reason a person is good is because they can adjust the amount of support they give you. Your first rep you might not need much help at all, but if you’re trying for a set of ten you might find that by about 7 you’re relying on your support a bit more. Now it’s time to try a chin-up by yourself! To start with you might want to find a bar that’s a bit above your hands when you have them extended and then do a little jump for momentum to get you up. Then extend back down fully (you see a few people doing cheaty chin-ups where they only go back half way – don’t be one of those guys) and see if you can get your chin back over that bar! It won’t happen overnight. But it will happen.